I quite liked this sort-of monster movie and alcoholism comedy-drama. Colossal is not for audiences who are asking for mindless monster destruction, although there’s a lot of darkly funny accidental destruction. Anne Hathaway is Gloria, who is far from glorious or glamorous, and she’s hardly the type to ever work or hit the gym or make love, either. For her, it’s about moving from one set of drinking buddies to another and getting blackout drunk which is her routine cycle. When her boyfriend (Dan Stevens, improbably too handsome and responsible to have been her mate for as long as he has) kicks her out, Gloria goes back home to upstate New York to an abandoned house owned by her parents. She’s so lazy that she never uses any room except the living room, as a place to crash. While there, it is spread all over the news that a Godzilla-like monster (but given enough structural variations so that it’s not too much like Godzilla) attacks the metropolis area of Seoul, South Korea not so much in a rampage but in a rumbling, clumsy way. Gloria gets a job as a waitress at a bar, not exactly a place to mature at. But she has just reconnected with her childhood friend Oscar (Jason Sudeikis) who owns the bar and who obviously still likes her. Yet it becomes a strange observation that while Oscar has feelings for Gloria, he never attempts anything to take their relationship to the next level. It’s as if he has guilt for even having loving feelings, and we learn, he too has a drinking problem that he uses to avoid taking new steps in life. They keep watching the monster attacks taking place on the other side of the globe on TV, and then one day Gloria figures something out: the monster is a direct projection of her behavior. If she stumbles and falls drunk, then the monster will fall into a building in South Korea. If she waves her arms, the monster will wave its arms and in one instance slap away a military helicopter. If she is ever to want the monster to go away, she is going to have to snuff her drinking problem. While there were a few minutes where I was worried that the story was stuck with no place to go after introducing this amusing revelation, it finds some corrosively funny situations to go. The catalysts are Sudeikis and his bar cronies who have a way of tripping up Gloria and bringing the worst out of her. Sudeikis isn’t ever asked to do drama, but he is seriously good as an antagonist in this story, and the movie has some peerless insights into alcoholism by what we see through him. I don’t want to overpraise “Colossal” with hyperbole, but it is something of a surprise. The movie has some entertaining dilemmas and I also found the ending to be quite ingenious as long as you leave practical logic at the door. 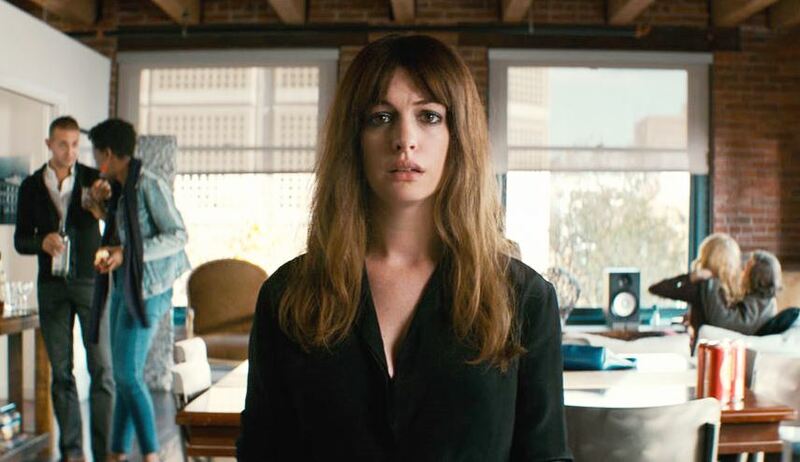 “Colossal” is said to be a favorite project of Anne Hathaway who gets to use the dark selfish side she explored in a serious film like “Rachel Getting Married” (2008) but channel it into an offbeat fantasy. 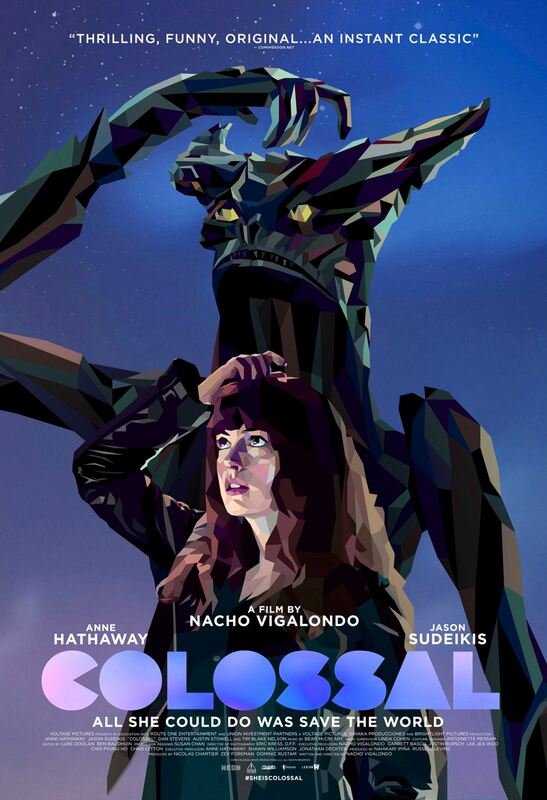 For some reason, “Colossal” did not strike up much business commercially even though it had the chance to, possibly because seeing a non-glam Hathaway doesn’t appeal (ahem, if her character had twenty spare minutes to fix her scraggly hair…). For me, I am such a fan of hers I can watch her with my jaw agape in anything – admittedly she’s irresistible to me. For fanboys, it didn’t pull them in because typically they just want a conventional attack the monster movie. I still contend with no doubt that this is a good movie for adult sensibilities. Writer-director Nacho Vigalondo previously made the Spanish film “Timecrimes” (2009), a time travel movie that’s equally offbeat, ingenious and something wicked. Film Cousins: “Weird Science” (1985); “Timecrimes” (2009, Spain); “Pacific Rim” (2013); “Godzilla” (2014).